5.28 Quart Capacity: this is most definitely one of the things I love most about the Instant Pot. I can create a hearty balanced casserole in the evening and use some of the meat left over to make beef sandwiches. Third Generation Technology: Instant Pot just continues to develop more and more – from the first generation that involved a mechanical timer, to the digital controller that first introduced delayed cooking. 10 Proven Safety Mechanisms: knowing that the electric pressure cooker isn’t about to blow up in my face, or even just knowing that I won’t lose my food all over the floor reassures me enough to leave the fate of my meal in the Instant Pot’s IP-LUX60’s tried and tested technology. 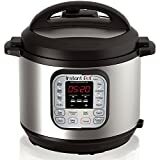 The Instant Pot IP-LUX50 6-in-1 Programmable Pressure Cooker is yet another reliable appliance from the brilliant masters of the kitchen – Instant Pot. Priced below $100, (see lowest price) this model is the perfect introduction to pressure cooking. ​With the Instant Pot IP-LUX50, gone are the days of hoarding numerous appliances, half of which never get used because you can’t see them – the Instant Pot IP-LUX50 isn’t only a programmable electric pressure cooker, it’s also a sauté(er), slow cooker, rice cooker, steamer and warmer, all in the space and convenience of one single machine. With the Instant Pot IP-LUX50, you never have to consciously think about the numerous machines in your cupboard collecting dust, because the Instant Pot IP-LUX50 displays them all for you – in the form of small, simple and clear buttons and LED screen. ​This electric pressure cooker also goes one step further as well; with ten built-in smart programs (Meat/Stew, Sauté, Poultry, Soup, Bean/Chilli, Congee, Steam, Multigrain, Rice and Slow Cook – which has three possible settings to choose from) and ten proven safety mechanisms (Pressure Regulator Protection, Excess Pressure Protection, Anti-Blockage Vent, Safety Lid Lock, Lid Close Detection, Leaky Lid Protection, Automatic Pressure Control, Extreme Temperature & Power Protection, and High Temperature Warming) to match. ​The Instant Pot IP-LUX50 is perfect for all your home-cooked needs, whether it’s keeping your food warm for you while you deal with a last minute work assignment, slow cooking your lamb shank to get it just how you like it or delaying the food being cooked (up to twenty-four hours) so that it’s ready when you get home from work. ​The cooking pot of the Instant Pot IP-LUX50 is stainless steel with a triple layer (three ply) base of stainless steel – the durable metal is dishwasher safe and non-toxic to the food inside, aluminium (to cause the food to be heated up more quickly and more evenly), and stainless steel on the outside to join seamlessly to the rest of the cooking pot, which is also stainless steel. I have had my Instant Pot for a little more than one year now and I love absolutely everything about it: from the dishwasher safe cooking bowl that means I don’t have to wait for the pot to cool off (it gets INCREDIBLY hot) before I start washing it, and by which point there’s food stuck to the bottom of the pan that takes a good ten minutes just to clean one part of it, to the user instruction manual it comes with (along with those mouth-watering recipes in the other booklet). ​I’ve found pressure cooking to be a healthy and fast way to get all of the nutrients I need; because I don’t fry things or boil them for so long that all of the goodness and vitamins seep into the water, not only does my food retain all of the nutrients and minerals, but the food also tastes delicious, full of flavour and my meat comes out tender without dripping in fat (which I’ll admit is nice on the odd occasion). Cooking with the Instant Pot IP-LUX50 has meant that preparing and cooking my meals now only take between thirty percent and a third of the time it used to, so I’m free to get started on dessert, or more likely start setting the table as the Instant Pot also cooks small puddings for me, I find I especially love how my Tapioca pudding comes out – creamy and delicious. ​The Instant Pot IP-LUX50 also comes with a one year manufacturer’s warranty so that if you have any problem with it at all, although I certainly haven’t (if there’s very little steam or noise being produced that doesn’t mean that the Instant Pot is faulty), then Instant Pot will repair it for you free of charge. ​I use the Instant Pot daily for the family meals now, and twice in the winter – I don’t feel guilty about this fast and efficient way to prepare food though – not with all the scrumptious and healthy recipes out there on the internet, some have even introduced me to vegetables I probably never would have heard of otherwise! ​Other goodies included with the Instant Pot IP-LUX50 are the steam rack – allowing you to keep the meat and vegetables separate for those really fussy family members, rice paddle – to get the rice off the pan easily, soup spoon – the people at Instant Pot have really thought of everything; and recipe/instruction booklet that also contains a general guideline for the cooking times of the different foods that the Instant Pot IP-LUX50 caters for and which built in smart program (and speed setting in the case of the slow cooker) should be used with each one. So what are you waiting for? If you’re rushing around trying to find a pressure cooker that cooks exactly what you want when you want it and, especially if you’ve got a smooth or induction top range, then the Instant Pot IP-LUX50 is the electric pressure cooker for you, and the slow cooker, rice cooker and all the other brilliant features that have been bundled into one machine so that it’s never difficult for you to find what you’re looking for again, and with the clear instructions that come with this amazing kitchen aid, you’ll find that, like me you don’t have any trouble at all. The Instant Pot IP-LUX50 is a revolutionary pressure cooker that maintains heat well, and keeps the food consistently under pressure. It is a firm favorite of ours, and firmly deserves a place in our top 10 pressure cookers.